For those that follow blues rock and guitar-driven music closely, Philip Sayce has been one of the most underrated artists in the genre for quite some time. Before launching a solo career, he was a sideman for Jeff Healey, Uncle Kracker, and Melissa Etheridge. After leaving Etheridge’s band, Sayce kick started his solo career and has drawn comparisons to many of the guitar greats. Sayce topped nearly 3,000 bands by winning the Ernie Ball Play Crossroads Competition for the opportunity to perform at Eric Clapton’s Crossroads Guitar Festival, held at the “world’s most famous area,” Madison Square Garden. We recently had the chance to catch up with Sayce and chat about his incredible experience. First off, it was excitement and a sense of gratitude and thankfulness. I don’t like to look at music in terms of it being a competition, so anytime there’s a competition I don’t think the fastest or the slowest player wins. I don’t think it’s about that. It’s never been about that for me. All I’m trying to do with my music is to put something positive into the world, something that’s going to be here longer than I’m going to be here, share what’s in my heart and leave the world in a better place in that way. So to win a contest is an interesting thing. Everyone who entered is valid. We’re all brothers and sisters trying to put good music out there to the world and trying to represent roots music. In the end though, I was overwhelmed and completely honored to be chosen. It’s a very, very moving experience to be recognized in that way. You say that everyone’s musical contributions are equal and valid, but there had to be some other competitors who you viewed as stiff competition. Anyone stand out to you or who you thought was a front runner? There were so many. If I looked at the list again I could probably go, that guy, that guy, that girl, you know. Just sitting here though off the top of my head that I can remember, Henrik Freischlader from Germany, a great musician, Anthony Gomes, Ana Popovic, there were so many talented entries. I wish I could look at the list right now. Five minutes – That’s tough. Not a lot of time to showcase your talent. Yeah, they told me that I didn’t have a lot of time. I didn’t even get a sound check. I asked if I could maybe bring a kick drum like the Lumineers or maybe a snare drum, something fun. Everyone is doing something like that when they are signing alone. They said, “nope just your guitar.” So it was kind of a fun test, a challenge having to go up there with just my guitar and an amp. I was just going to go out and play, so I choose “Steamroller.” I started writing that song actually as a tribute to Eric Clapton. It reminded me of something I heard him play once and then I finished writing with my friend Dave. So I started with that and after that I went into a little bit of “Slip Away,” went back to “Steamroller” and finished off with a little free time at the end. It was totally just sort of improvised. It was kind of a tribute to my heroes. The free time at the end especially was for Jeff Healey, because when Jeff would go into outer space at the end of a song it was quite an experience; or when SRV and Jeff Beck would go into outer space in that free time moment it was special. It was just me trying to tip my hat and say thanks to all the people who inspired me. Such a short time, I just kind of had to go for it. It might not been a lot of time but if someone tells you that you have five minutes to play at Clapton’s party, you make it happen. You make it work. What were the highlights of the experience for you? I just tried to play what was in my heart that day. There’s one moment at the end where it went into this thing and I held a note for a while and hearing the audience respond around the area, that swirl of audience sound was amazing. It was inspiring and exciting, and it was cool to connect with people in that way. That’s what music is – people exchanging energy in that way. That’s what I thought was really cool. I got a lot of positive feedback from the cats that I admire. This is the music business with the emphasis on business and this festival wasn’t about that at all. It was about a community of people supporting each other in music with the goal of raising money to help people who have addiction problems. I think that supersedes anything about any contest. This was a festival to raise money to help people who are really down and out. To me, that was the priority and to put something healing out, and to be able to do it in Clapton’s house, at his party, at MSG was amazing. Anyone’s performance that first night really stand out to you? 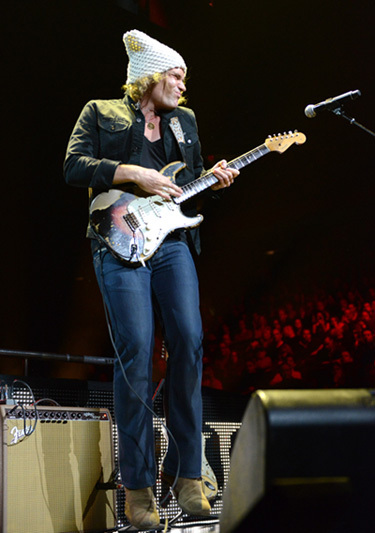 Philip Sayce lights up the Madison Square Garden stage at Eric Clapton’s Crossroads Guitar Festival. Doyle Bramhall. He’s been an inspiration to me. It’s so fluid, greasy and beautiful. There’s a reason that he produces Eric Clapton. He’s a bad, bad man. He’s just got the blues power. His performance stood out. Eric stood out too. Just a tremendous energy every time I saw him. John Mayer’s set with Keith Urban was good. I mean everyone on that bill is so heavy. They are just going to wipe you out. The Allman brothers really blew me away. What a powerful group and seeing Eric sit in with them was just awesome. You’ve played with some pretty heavy hitters already, Jeff Healey, Uncle Kracker, Melissa Etheridge. If you didn’t have to fill a slot between the main acts and had a chance to sit in with someone else from the festival, who would it be? Each and every one of them! Every one of those artists on that bill I respect and admire. Of course the grand MC of the night Eric would be cool. He’s been one of my heroes since before I was born. I’d love to play with Eric. Anyone up there would have been awesome. That’s just the energy, the vibe that was at this show. Such a rare vibe and that came directly from Eric. I mean he can play whatever he wants when he picks up the guitar, but what he plays is real and it’s always real. It’s something that sticks with you the rest of your life. That’s what I take away every time I see him play. I guess if I had to choose it would be him. Sonny Landreth joked backstage about putting together a petition among the musicians and giving it to Eric to hold the festival again. Every tour Eric makes the comments that he’s hanging it up at the end and not going to tour anymore. Clapton made the “see you in three years” comment at the end of the show. Any mention of another festival that you might have overheard? No, but I get the feeling that there will be. God willing you know. It would be a real treat to see Eric do this three years from now, three years from that, three years from that and on and on…. As long as he can. It would be a real treat for you and me and everyone else. I think he sounds better now than ever. His singing and playing is as strong as ever. I think he’ll be touching hearts and souls for a while yet. B.B. King is 87 years old and he’s still going, so let’s hope he keeps going. I just want to thank Eric and Ernie Ball for the support. I appreciate the opportunity to share my music with everyone. That it’s important that artists stick together and support music. Especially this blues, soul, and roots music that speaks to the soul. This guy’s amazing. When I first listened to Peace Machine, I was kinda shocked with it’s dirty and heavy sound. I though it was missing something, something pop. Then, I realized, that I had something missing. After listening on and on I was amazed with Philip’s work. I think he’s the best blues/rock guitarist nowadays. another nice Interview, Kevin, thanks a lot! 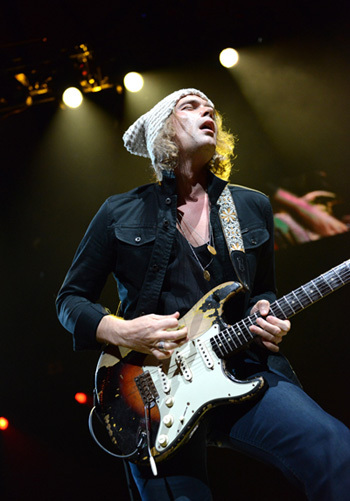 Philip Sayce has been an amazing musician for years! Good to see him get this opportunity to be more broadly known! Fantastic musician and fantastic interview, congrats Philip.